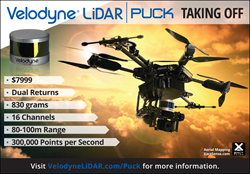 At two of the nation’s leading surveying and mapping technology conferences this spring -- International LIDAR Mapping Forum (ILMF) in Denver and SPAR International in Houston -- Velodyne LiDAR put its new VLP-16 LiDAR Puck firmly on the map. Working in tandem with some of the top integrators in the mapping sector, Velodyne showed the diminutive sensor in live demos at both events. The company also unveiled VeloView 3.0, a new version of its free, open source visualization and recording software, which now incorporates compatibility with the VLP-16 and also supports Dual Return, for both the popular HDL-32E and the VLP-16. The Puck offers an unsurpassed performance-to-price ratio, achieving 16 channels of LiDAR data with 300,000 measurements per second for only $7,999. o XactSense Inc. showcased a new platform for low-altitude aerial mapping using the Velodyne LiDAR Puck. In anticipation of the Puck’s release, XactSense designed a new adaptable folding 8-rotor UAV called the “MAX8.” The platform integrates the industry's only electro-stabilized LiDAR gimbal with thermal and high resolution cameras, outperforming other systems in terms of features and flexibility. The resulting mapping drone is the lowest-cost option for those looking for more than just a photo or video from their UAV investment. “We’ve been dying to get our hands on this new, smaller sensor – it’s a game-changer,” said Andy Trench, founder, XactSense Inc. “The amount of calls we are fielding from the mapping and surveying industry for an aerial system like this is astounding, and we are excited to offer a solution that allows many more companies to consider UAV a must-have technology in their toolbox. “ XactSense’s new system is ideal for a wide variety of missions, including gas pipe line inspection, DOT and engineering projects, power line corridor mapping, and cell tower surveying. o Phoenix Aerial Systems showed its AL3 solution for UAV-based mobile mapping, combining high-end IMU with differential GPS and the Velodyne LiDAR Puck. Phoenix Aerial’s new Scout Series is designed for low size and weight, high accuracy and robustness, and works with either the Velodyne HDL-32E or the VLP-16, within a 100-meter range. All systems can be used for mobile mapping in airborne and ground missions. o VIAMETRIS, which develops innovative technologies in the whole scope of mobile 3D scanning and automatic data recognition, presented an indoor mapping trolley system that can incorporate the VLP-16 for an outdoor version. VIAMETRIS previously worked on a development involving the Velodyne HDL-32 spread on a car’s roof. Using innovative 6DOF (Degrees Of Freedom) SLAM (simultaneous localization and mapping), VIAMETRIS is among the earliest champions, and adopters, of the VLP-16. 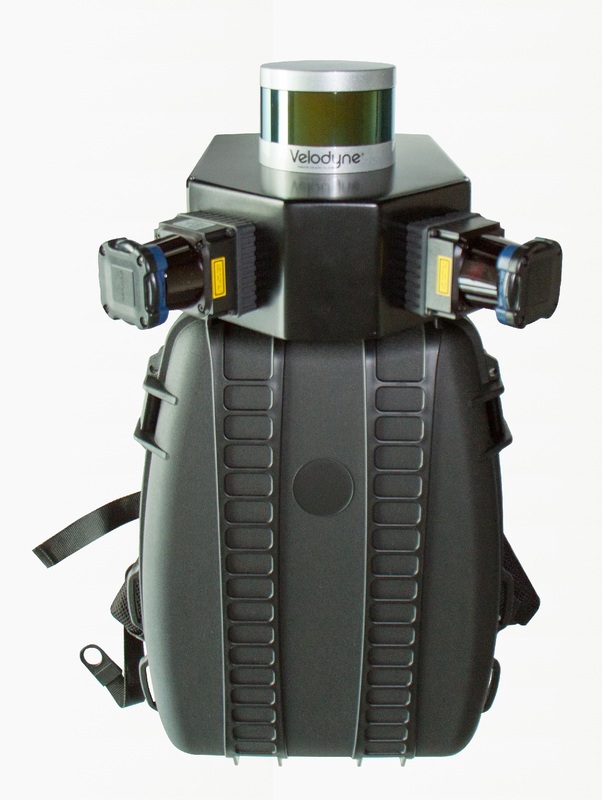 The company’s research team developed a backpack prototype based on a VLP-16 to manage positioning in indoor and outdoor environment. Because the VLP-16 is a 3D sensor, the positioning process is able to calculate a trajectory whatever the environment. o Topcon presented its second-generation mobile mapping solution at both shows, migrating from the IP-S2 with Velodyne’s HDL-64E to the much more compact IP-S3 using the HDL-32E. The IP-S3 obtains high-quality measurements with detailed shapes of objects based on 5MP 360° cameras and 700,000 data points per second from the HDL-32E. An instant preview of the acquired data is available immediately upon completion of a data collection session. o LiDAR USA.com, a longtime Velodyne partner and system integrator, showed flexible solutions for mobile mapping using both HDL-32E and VLP-16 sensors, based on a platform that can be mounted on cars, boats, trains and other mobile conveyances. o Mandli Communications introduced its Maverick mobile mapping system at the SPAR show. A portable, powerful, accessible spatial data collection system, Maverick combines 360° LiDAR and imaging technology with an integrated position and orientation system. During SPAR, Mandli underscored its mobile capabilities by offering rides on a Segway equipped with the Maverick system, capturing data in and around the SPAR venue. o Routescene, based in the UK, presented its LiDAR POD at the ILMF show, supporting both the HDL-32E and the VLP-16 as options in a highly compact, sleek, carbon-fiber design. Combined with Routescene’s LidarViewer, raw data can quickly be turned into usable GIS information. Routescene solutions are available in the automotive, marine, rail and UAV markets.